Rolling Stone: In its refusal to deny the malignant allure of Mob life, Scorsese's indictment gains in intensity. After turning Judas to save his neck, Hill, who went into hiding with his wife and their two daughters, told Pileggi, "I'm an average nobody. I get to live the rest of my life like a schnook." By capturing the pain as well as the ignorance in that statement, Scorsese's GoodFellas makes poetic drama of warped ambitions. Roger Ebert: "GoodFellas" is about guilt more than anything else. But it is not a straightforward morality play, in which good is established and guilt is the appropriate reaction toward evil. No, the hero of this film feels guilty for not upholding the Mafia code - guilty of the sin of betrayal. And his punishment is banishment, into the witness protection program, where nobody has a name and the headwaiter certainly doesn't know it. 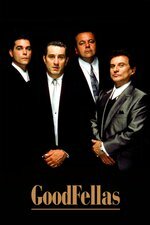 NYTimes: It is the mobsters' ferocious pettiness and the smallness of their aspirations that are so terrifying in ''Goodfellas.'' This may be the most cautionary aspect of the film. After all, America made them. Is Goodfellas the Perfect Gangster Film? Argh, such an incredible film, arguably Scorsese's best - there's nowhere else his love of cinema itself is on such exhilarating display. That said, it also shows Scorsese's flaws - a paean to excess, thuggishness, abuse and violence wrapped in a slick and stylish package. I don't mean to invoke these 'enlightened' times, but the vicious beatings dealt to Lorraine Bracco's Karen and other women in the film are deeply uncomfortable now, beyond any shock value they might have had 26 years ago. But it's an iconic film for a reason, not only in Scorsese's channelling of what feels like the entirety of cinema history through its 2 -and-a-half hours, but in the way its performances, structure and dialogue influenced every subsequent gangster tale - there's a reason that The Sopranos made heavy use of the Goodfellas cast, and it's not just that Italian-American actors are hard to find. Bracco/Gandolfini recollects Bracco/Liotta (perhaps a flawed attempt to reconcile the abusive relationship? Pass me the beanplate..) , Michael Imperioli's Christopher is hapless busboy Spider grown-up, and so on. But if you're not utterly gripped by the time Henry introduces us to the guys, I can't help you.. Anything I wanted was a phone call away. Free cars. The keys to a dozen hideout flats all over the city. I bet twenty, thirty grand over a weekend and then I'd either blow the winnings in a week or go to the sharks to pay back the bookies. Didn't matter. It didn't mean anything. When I was broke, I'd go out and rob some more. We ran everything. We paid off cops. We paid off lawyers. We paid off judges. Everybody had their hands out. Everything was for the taking. And now it's all over. And that's the hardest part. Today everything is different; there's no action... have to wait around like everyone else. Can't even get decent food - right after I got here, I ordered some spaghetti with marinara sauce, and I got egg noodles and ketchup. I'm an average nobody... get to live the rest of my life like a schnook. One thread, every single kid from Metafilter favorited one of my comments, even though it was just a mangled quote. You know why? It was outta respect. I'm gonna get the papers, get the papers. The reason I really like this film is that it both acknowledges the ugliness of life in the Mafia, but the allure as well. In the Godfather, the characters are often a little distant from the violence itself: sure they leave a horses head, but you don't see them sawing the thing off. Scorsese isn't going to let you off that easily, and that opening is such a wonderful intercut between violence and humour. I also enjoy that, unlike the Godfather, the lead female isn't dragged in helplessly, but actively engaged in the world. It is alluring, and we see that Hill feels at least like he has no other options. I also like how, while the Godfather is explicitly a story about family, this is a story about those people excluded from the wider family. All the leads we follow here are somewhat excluded from the main clique, and it shows. They are all desperate to be in the loop, and that desperation feeds into their behaviour. There is no family loyalty here, just weak ties of mutual avarice. When one of them gets in the other's way, you know there's going to be trouble. Yeah, our main characters are the folks who aren't in the actual mafia - the Godfather is about the people at the head of the family, watching the generals and presidents moving about their domain. This is about the folks a couple of layers out from that. The minions and henchmen scuttling around at the edges. I'd be curious to learn what that critic thinks of Goodfellas now. I think it holds up a lot better than Mean Streets, actually. There is something about this film that makes it endlessly rewatchable. It is not my favorite film, or even my favorite Scorsese film, but it is probably the film I've seen the most in my life. I think what makes it rewatchable is the kinetic pace, which leads to my one real complaint: When the movie gets to the helicopter scene ("I was gunna be busy all day..."), I feel like it kind of grinds its gears in one place for too long. It feels like it is going back to do a bunch more exposition just so we can get to the end, when it would be better to build off the exposition that is already in place and end the thing. In other words, after Tommy gets whacked, it should be wrapped up quicker. Starman, I just rewatched it for the first time in many years. That whole coked up final day is meant to be increasingly unhinged and manic and supposed to drag on forever, until the cops come in. Thelma did amazing editing work. And Tommy's mother, she acts as if she is home on the set, lecturing Marty instead of a mobster. I love her and her painting of the dogs. Not only do I love all the tiny cameos from people who'd go on to bigger things, whether Michael Imperioli or Tony Sirico or Isiah Whitlock, I also love that this movie showcases old New York (hello, Washington Street! hello West 9th and Smith! ).